Part 1 of ‘Text Recognition’ outlined the theory of optical character recognition and pointed to applications for Windows PCs. Now it’s time to look upon apps for the iPad and iPhone. I reviewed three apps. All of them are designed for iPhone but can be installed on an iPad as well with the well-known limitations (only portrait mode, app size with zoom factors 1x and 2x). is a free app and works accurately. A bit strange about it is that you need to send your scan via E-Mail in order to get the text-based version. If that works for you, the app works quite well and doesn’t cost you anything. is a well-designed app and turns photos of text, coming from your built-in camera or elsewhere, into digital, editable text. What makes it great is that it’s generally accurate and it’s easy to use. Other apps offer more features to adjust to images that are not perfect (perspective, contrast, etc.). But in most cases it’s the faster job to eliminate some errors in converting than to try out uncountable adjustments to increase the quality. is rather expensive. 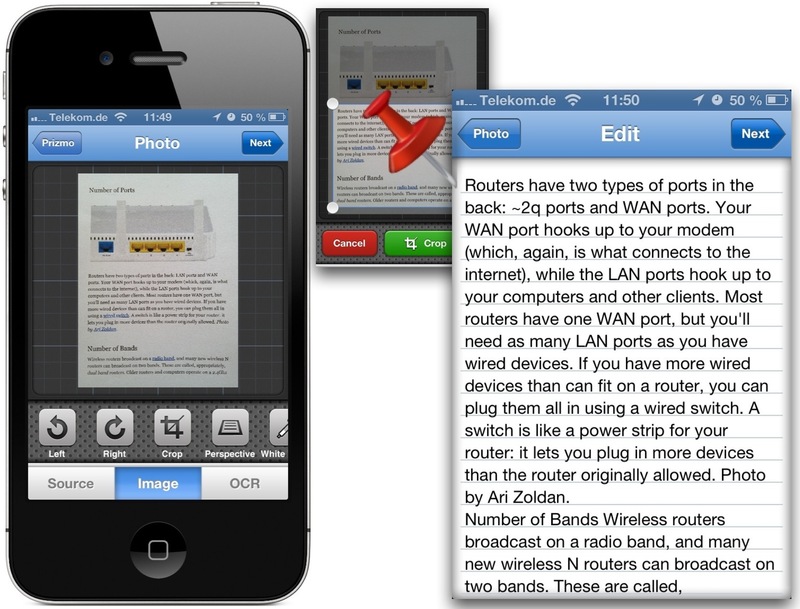 What you get is a comprehensive OCR app that is pretty accurate. If you want something that can handle regular text as well as business cards, bills, and whiteboards, Prizmo is a valuable option. It will also read recognized text back to you, which certainly has its useful applications as well. There are different voices available (Danish, Dutch, English, French, German, Italian, Norwegian, Portuguese, Spanish, and Swedish) for which you have to pay about $3.50 each. I fed the apps with two different pages but took new photos with each app as each app had varied requirements and preferences for the camera. 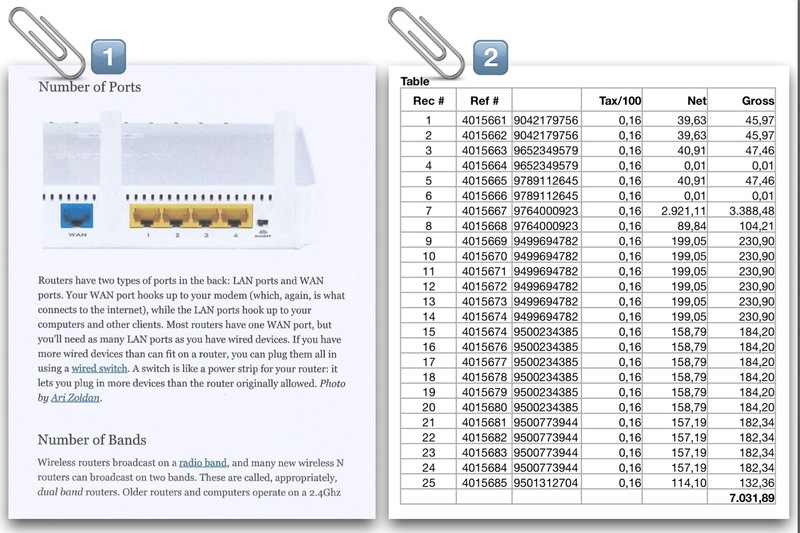 There is a simple page and one with a simple table. Here is the dish for OCR capable apps. All photos have been taken from within the apps. The device was an iPhone 4S without using it’s LED flash. 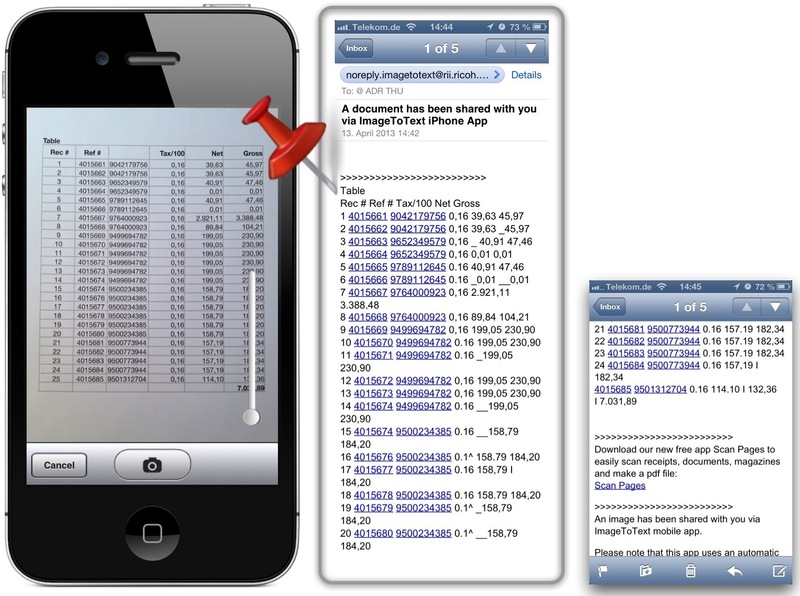 The image shows the apps screen and the returned E-Mail containg the converted text. Conversion of tables can be used to extract data line by line. 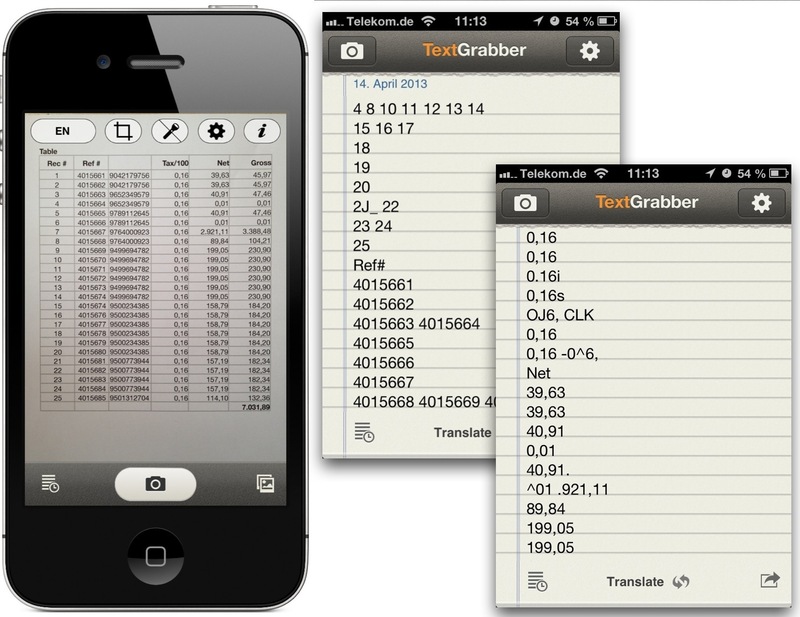 TextGrabber offers full camera control as well as cropping. 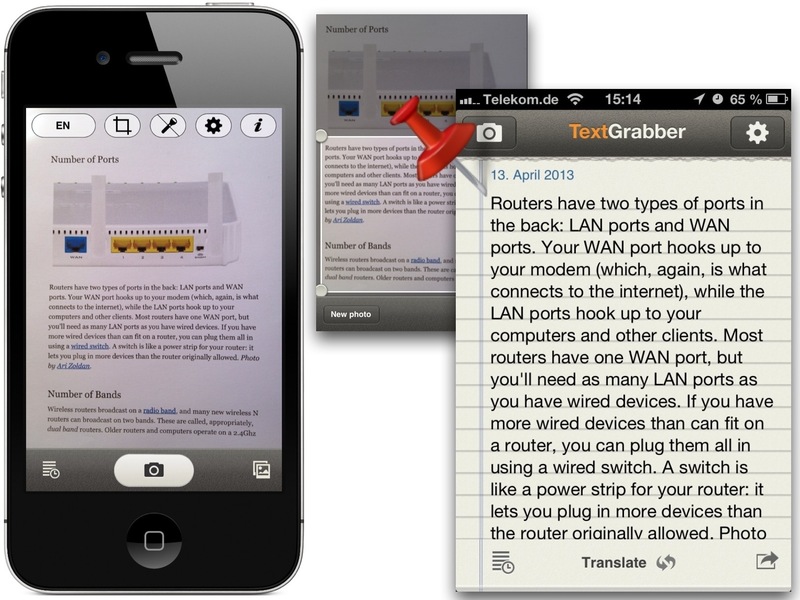 Sharing and translating (using Google Translate) are additional features of TextGrabber. I checked the translation into German and it was pretty good in this case. But obviously this depends on the content. I saw Google translations from US English into German where the result was as disastrous as the Titanic case. Converting tables into text is not usable. Prizmo offers a special feature for converting bills. If a photo is taken there is vertical divider line with which lables on the left side con be separated from prices on the right side. But even with this functionality 50% of the extracted lines were invalid. This images gives you an impression of some other features. A pretty nice feature if Prizmo is that scans are saved in the documents folder with the original image and the extracted text. There is no need to spend much money for an OCR capable app. By the way: The prize of Prizmo is not far away from being dubious. Admittedly Prizmo presents a perfect UI and many additional features other apps don’t offer. 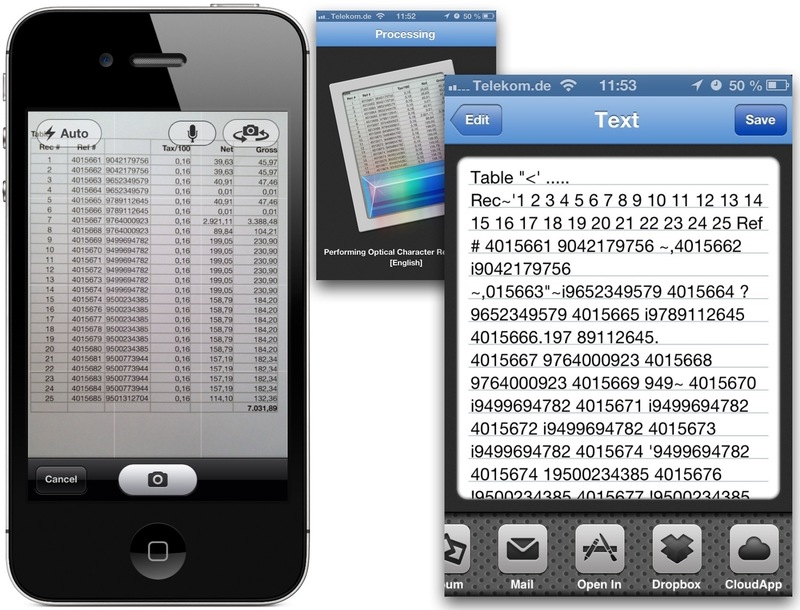 Prizmo was updated on 2013-05-15 and I checked it again regarding scanning of tables. The result: Text recognition still perfect, table recognition still bad. The results of using additional features of TextGrabber or Prizmo didn’t improve the quality of the result. Some features had the reverse effect of what was intended. 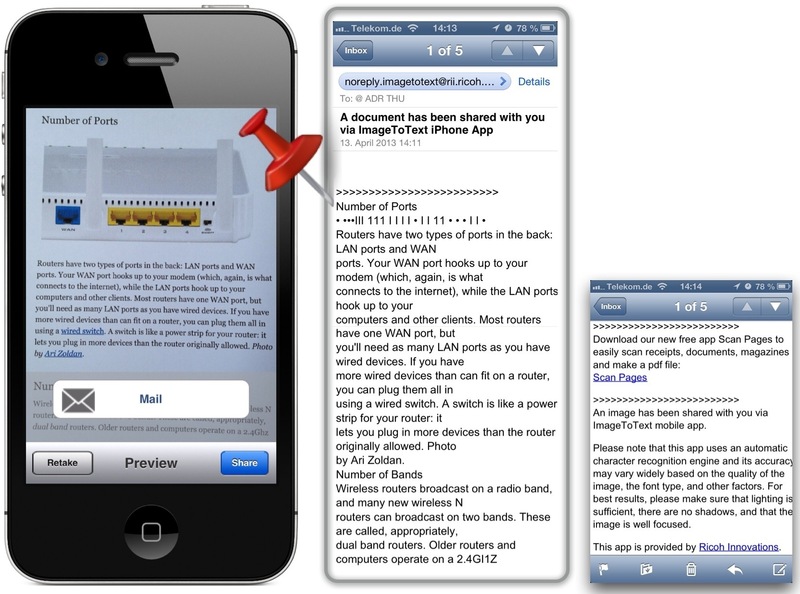 The best result in converting an image to text was achieved by the free app ImageToText. The reason seems to be obvious because there is no OCR processing implemented in the app. By sending the image to an external webserver some grown-up OCR software there can do the job. Do not try to begin digitizing lots of personal or business documents with one of these apps as it is suggested on websites and other media. In no case a conversion was free of errors and manual corrections were necessary. But it’s better to have one of these apps than to manually write down text from on image if this occurs occasionally. Comments and Likes are appreciated.